It’s hard to believe, but in January this blog will turn four! It’s been fun looking back to where I started, especially when it comes to decorating my home. 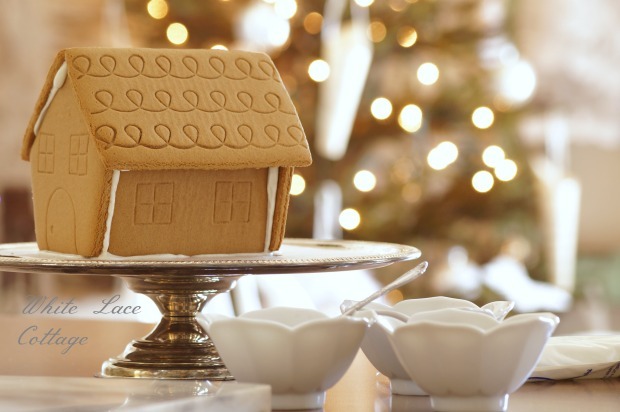 I’ve shared lots of holiday decorating ideas over the past almost four years. And wow has my home changed! I’ve always had my home decorated with vintage style, but I’ve changed from farmhouse, to more of a shabby romantic look. That photo above was taken two years ago, as was this photo below. I worked at marrying these two styles together, and it worked perfectly. I still love the farmhouse look, but I have fallen hard for soft pastel colors! 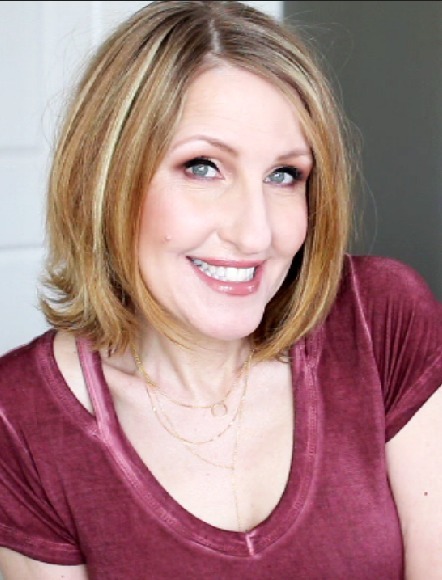 So today I thought I would share my home tours from a few years ago, and give you a few tips on Holiday Decorating Ideas. You’ll see that even then, I was using very little to decorate my home. This is the first time in several years that I haven’t added my paperwhites. They’re beautiful, but it was time for a change. And speaking of changes, I also didn’t decorate one of these gingerbread houses this year. And no, I didn’t bake that, I’m not that talented! But they are fun to decorate, that’s the best part! My daughter usually enjoyed decorating these as well, but she didn’t request one this year. 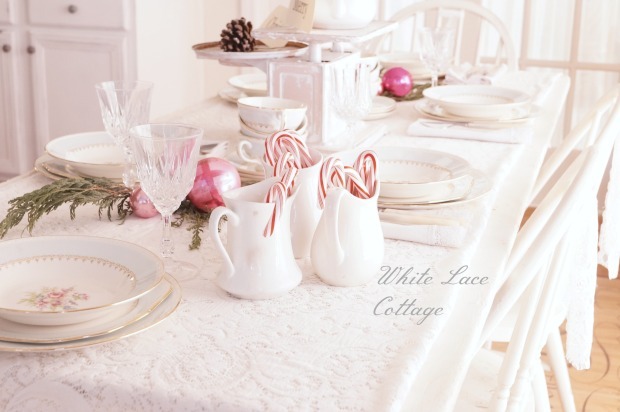 You may be starting to get your decor out and you are thinking, what should I do this year? Or what changes can I make to simplify things? Next week I will be revealing my home in several tours. I did a very, very simple holiday decorated home this year. 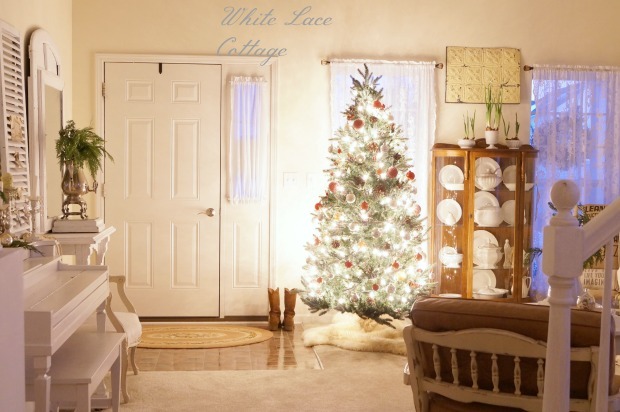 But even with the simplicity, it still looks like a home ready for the holidays! While you’re visiting my posts from the past, take a look at what I’ve done. And incorporate your style within your inspiration found. If you are looking for a few ideas for your home, I have a few tips for you. Don’t make it complicated. If you are looking to freshen things up, but you are on a budget look in your yard. Do you have branches that can be spray painted, and added to a vase? Or fresh greens from your own yard! If you do use them! It’s free, and it will bring a little nature into your home. Add a splash of color. 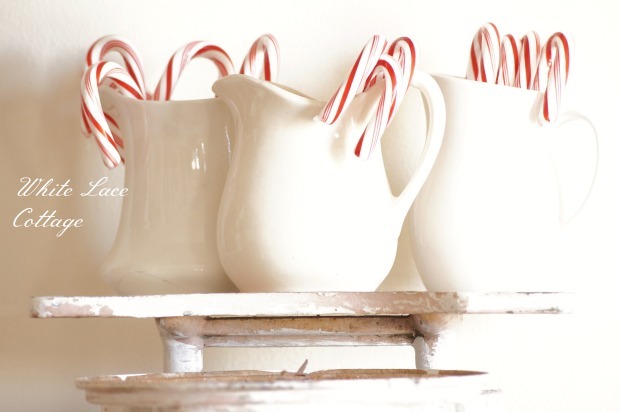 Candy canes can add a pop of color on a tree or in a pitcher. 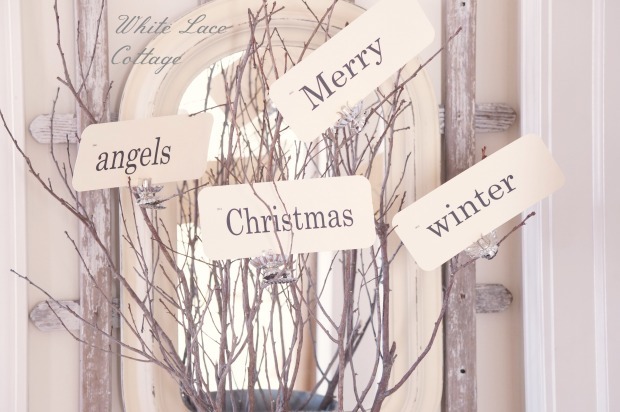 Making your own garland is a cinch! I made my own garland using vintage music sheet paper. But you can just purchase paper on a roll and do the same thing! 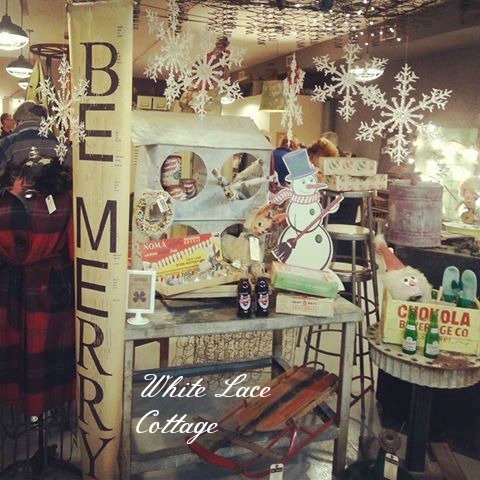 This photo is from my friends shop, which inspired me to make my paper garland last year, you can view that HERE. Make a simple centerpiece. A wreath can be used as a center piece, or a tote filled with ornaments looks pretty too! Be thrifty and use what you have. 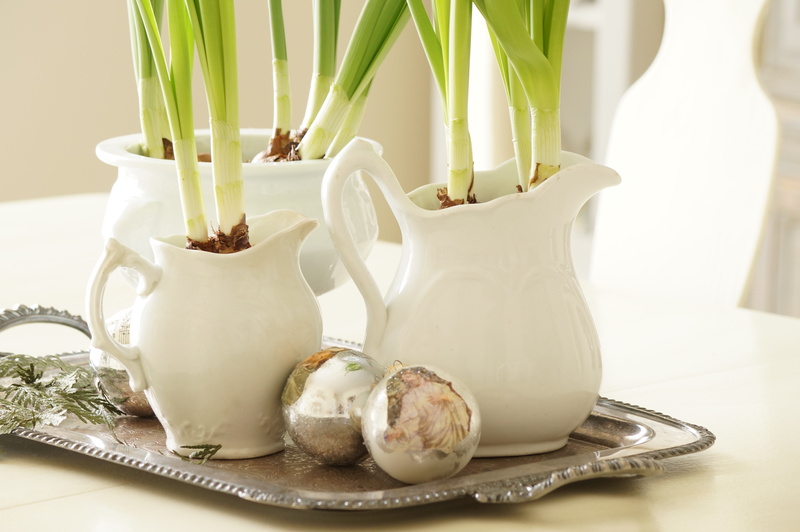 Go through your stash and see what you already have to freshen up your decor this year. Some things can be altered and used it different ways to give things a new fresh look. Decorate with gifts. For fun add a gifts under your tree that are decorative. I don’t usually wrap my gifts until a few days before Christmas. In the meantime, I just wrap up boxes using the same paper and place them under the tree. Use papers that compliment your decor in that room. This year, I used tissue paper that I found at…yep a thrift store. I will make a confession, 98% of what I purchase, including clothes come from a thrift shop or resale shop. Remember that when I share my home looking all pretty. Here are a few links to visit, and check out. I hope they will inspire you. I am so glad that you have continued your use of pastels – they are my favorite also. So many decorating blogs have changed from soft pastel touches to only using gray, white, brown and black. Rooms all look the same from one blog to the next – they are nice, but not what I consider pretty ( I need some touches of pink or pale aqua). 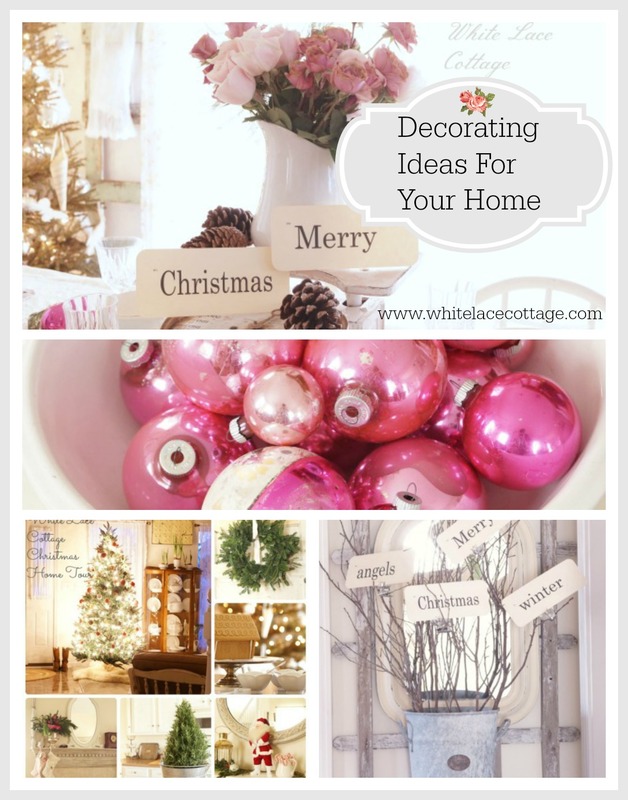 Yours is one of the few blogs left where I get many doable and affordable decorating ideas from. Can’t wait to see your Christmas tour! I love your pale colors and your wonderful style. I can’t wait to see your house and the changes you have made. Thanks for the tips on decorating for Christmas.